I wasn’t always an artist, but I have always had the desire to create. I never really was far away, just not there yet, doodles in notebooks, illustrated lab notes as I followed my career path with my MS in biological sciences into research and teaching. For many years that creativity came out in original handcrafts, the garden or cooking. A watercolor workshop with a friend opened up the world of painting. All sorts of ideas came to mind, journaling on travels, painting for friends and family, never dreaming that I could be a “real” artist. I started with watercolor classes, have mentors in the local Sacramento artist community and further augmented my studies with workshops from nationally recognized watercolor artists. Painting for me is an expression of a memory, a feeling, a moment captured and shared. I try to be true to the natural world but evoke emotion, motion or something tangible for the viewer. 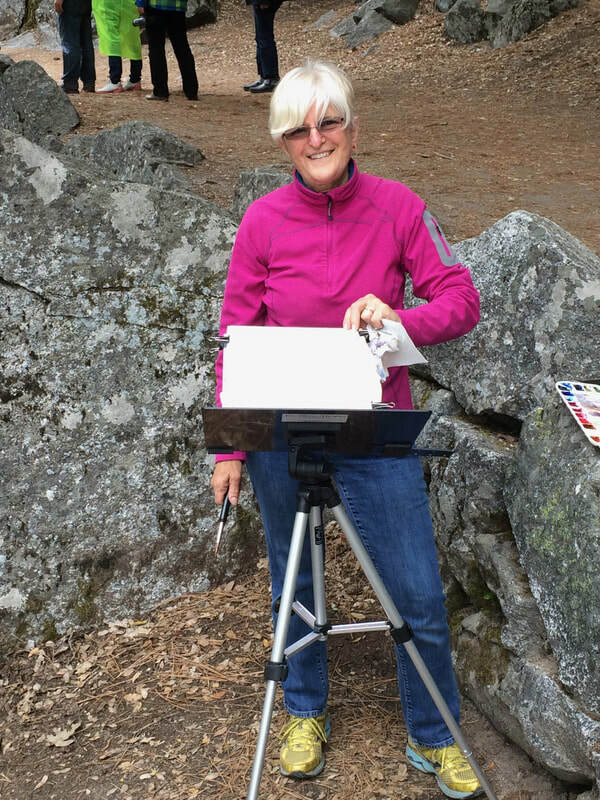 I paint, journal and sketch plein air, which become my subjects for studio composition. It really is quite enlightening when friends and family give you accolades, but after successfully doing a juried show, I really had begun the journey as an artist. I hope you agree and will want to give my creations a new home to share with your family and friends. 91st Annual Sacramento Camellia Show Paint Out March 2015, People’s Choice Award , "Three "